All archery clubs require you to have completed a Beginners Course (Basic Training) before you are allowed to join or even shoot in most cases. 4 x 3 hour sessions. All beginners need to have attended a minimum of 3 of the sessions in order to successfully complete the programme and be awarded the beginners certificate. We charge £75 for our beginners course; there are no refunds for missed sessions. This fee includes coaching, a beginners' manual, the loan of all the necessary equipment for the duration of the programme and, if you do join our club, the equipment loan is extended for a further 6 weeks following on from the course until you are more confident in your technique and are ready to purchase your own equipment. 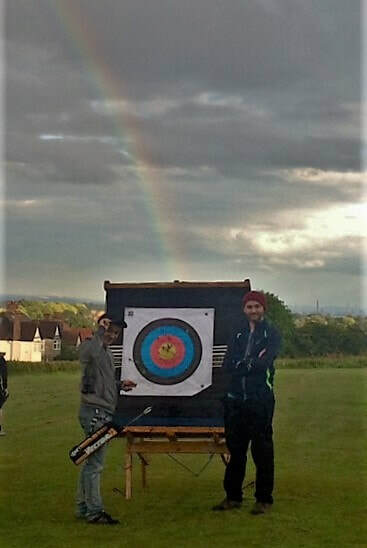 We do not recommend that any person taking up archery for the first time purchases their own equipment until after the beginners course and 6 week loan period as it takes this time for your technique to settle down a bit , your strength to increase and your draw length to become more consistent. It is an expensive purchase so it is better to wait and make sure you are getting the right thing for you. The course we run is according to the official Archery GB curriculum and is accepted by all Archery GB clubs across the whole of Britain. We try to run at least one course per year but the spaces fill up quickly as do our membership spaces. As we are a small club we do sometimes reach our membership capacity and will suspend running beginners courses until such time as membership spaces become available. We don't feel that it is fair for you to complete a beginners course and not be able to join the club, so we generally wait until we can accommodate attendees. ​for further information please contact the section secretary, Mark Murphy, via email at mossleyhillarcheryclub@gmail.com or message us via facebook.